This set of Caran d’Ache Luminance coloured pencils offers an excellent selection of the range's best colours and 2 blenders. Caran d’Ache Luminance coloured pencils are the most lightfast of all coloured pencils meeting the highest of international standards: ASTM D-6901. With solid leads and a wide range of colours created from highly concentrated pigments, they have been made for professional level work. The velvet finish of these pencils has come from two years of technical research which also developed the richness of the shades and allows for overlaying, mixing and gradation. This set contains an extensive range of 76 colours along with 2 colourless blenders, which can be used to unify, mix, blend and intensify the colours. 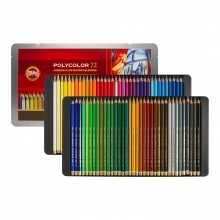 It is beautifully presented in an attractive box and would make the perfect gift for any creative. Colours included in this set: 214, 182, 181, 661, 171, 161, 662, 755, 162, 660, 120, 599, 585, 589, 350, 070, 061, 850, 030, 820, 810, 240, 821, 242, 801, 001, 866, 906, 407, 046, 069, 065, 077, 876, 836, 034, 036, 037, 548, 039, 846, 736, 025, 015, 470, 225, 220, 729, 739, 159, 185, 180, 009, 508, 507, 495, 808, 504, 004, 002, 803, 902, 093, 862, 802, 842, 872, 832, 732, 041, 571, 083, 112, 630, 129, 095.